You've been setting up meetings with Saint Peter for months now. You've met up for coffee, you've borrowed a conference room and set up a power point, you even invited him over for a small supper the saint's favorite food, loaves and fishes. But as much as he seems to enjoy your get-togethers, he still refuses to give you angel wings before you "go beyond the veil". He says you'll have to wait until you get your own cloud and you have to fly there from heaven's main hub. Cause while we romanticize angel wings, they really just have wings for sky born commuting. Sure, it's a lot more fun than traveling by car, but there's no way you can get a set before you move on. In the meantime, you might as well practice your angelic look with these gorgeous set of angel wings. These lightweight wings are printed on sheer fabric that'll let the light shine through. The fabric is decorated with a silver feather pattern. The tops of the wings are trimmed with thick white feathers. 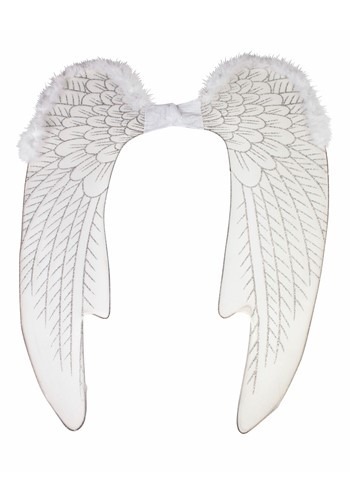 And the middle of the wings have elastic bands attached and can be slung over your shoulders to keep them comfortable even as you go about your good deeds.